New Harry Potter trailer is out!!! Ok, I have a question for all you out there: if you could spend an entire day with someone from the future, who would it be and why? Today, I listened to a song that I've been successfully avoiding for almost 2 years now. It used to be my absolute favorite. I listened to it everyday, I set it as my message alert, it just made me happy. Then that all changed, and those memories that I associated with it were too painful to think about, so I banished it from my life. As I was getting ready to write this, I brought up the new Ingrid Michaelson CD, and the first song is "Be OK" in which the chorus says "I just wanna be ok be ok be ok". The me of two years would have taken that song and made it her anthem. But the me of today, the me of right now, knows that I am already OK.
Tonight, I was just in a Jack Johnson mood. I bravely clicked on the song, and sang along. The memories from way back when didn't come flooding back in a painful flurry, but instead, only a few came to mind, and I actually smiled. Someone once told me "don't let good memories go to waste, and don't let good lessons in life get swallowed up in pain". I've done that for so long, but now I realized I've gotten to that point of just "remembering" and not being consumed by that heartbreaking feeling all over again. It's a good place to be, and I'm happy about it. I could talk about...how I desperately need to reset my internal clock, I couldn't fall asleep until 4:30 last night! I could talk about...how I got a phone call at 9:30 to go walk the dog at the house I work at, and I went. I could talk about...how I got a parking ticket because of DC's completely screwed up way of posting signs. Wait, let's talk about this one for a sec: Seriously, WTF is the point of posting a sign that says "no parking from 4-6pm" and then TWO SIGNS BENEATH THAT ONE posting one that says "no parking from 8am-4pm"?! DC residents, THIS is where your tax dollars are going! I've got an idea, post a sign that says "no parking from 8am-6pm" That makes things A LOT clearer! I could talk about...I have a less than two minute presentation to make today, and I'm so nervous I think I'm going to puke. I could talk about...my lack of motivation to post a vlog for today's 20sb event. I could talk about...how thanks to a lack of a hairbrush and now lack of a hair dryer, I looked like a drowned rat today. Real pretty. I could talk about...how I'm beginning to get really frustrated with certain people in my life. I could talk about...how I want to go into an industry that is based on creativity, yet I feel like I have none. I could talk about...how my room looks like my closet threw up all its contents, and I have no plans to change that any time soon. I could talk about...how I'm severely underdressed for today's 50 degree weather. But no...instead, I'm going to try and see if I can turn my day around and see things in a different light. Update: All is not lost! I have found something that has made me smile today! This is a toughie. I do like forever 21, but usually just for going out clothes. For serious things I like Ann Taylor Loft or Express. To look at and dream: Crate & Barrel. Oh love. To actually buy from: Ikea. or Target. Hmm...right now I'm going to say Osaka, Japan. I've been dying to go back, and I'm determined to find a way. Chili's Chocolate Chip Paradise Pie....it's like heaven in your mouth. My family splits two, between the four of us. I love all music, seriously. Right now, I'm on a big acoustic kick. Sliding Doors. I love everything about it. The whole "What-if" scenario never fails to entertain me. Yoga. Hands down. Pure Barre is a close second. and running is dead last. Um...Chocolate filled croissants? Please and thank you! Oh, so many options here. In high school, we contemplated trying to invent a "coffee iv drip", but then decided we didn't have enough time to fully think it through. Instead we resorted to chocolate covered coffee beans. At 7:15 in the morning. This was after I had already polished off a starbucks double shot and bottled mocha frap. Yeah. Nowadays, I tend to brew it at home and add some Hazelnut coffeemate. The rare times I do buy, I try to get it from the coffeeshop on campus. Hazelnut latte is mmm mmm good. I've been doing some research into the major ad agencies around the world. I stumbled across this one by Leo Burnett. A-DOR-ABLE. Now, go on and tell me you didn't giggle at the total cuteness that overwhelmed the screen just then. Go on. I dare you. The look of pure innocent joy that comes over his face is priceless. He likes her because she has a pony-tail! How much cuter can you get?! It's Monday, people shouldn't be required to think on Mondays. I've decided to go with my loves and hates for the time being! Late night conversations with best friends. Having cash in my pocket!! Reading posts like these on Monday mornings while I enjoy my coffee. Pay particular attention to the 10th paragraph. Getting excited for the holidays! - This year for Thanksgiving, my mom and youngest brother are driving up, and my other brother is flying down and we're all meeting at my Uncle's place in VA for a very large family Thanksgiving, I always enjoy large Thanksgivings. It makes it that much more special. When my professors make up words like "religiousosity" I mean, seriously? Liars - nothing gets me more angry than people who lie to my face. Deciding on topics. I have two large presentations/papers that I need to have topics for soon. And the guidelines for both are: "Whatever you feel like doing" within reason of the course topic. UGH. It's not a big deal or anything, only up to 70% of my grade in one class, and 40% in the other. Let me know if you want to help! Warm weather in October. Seriously? A high of 85 is unacceptable this time of year in Washington DC. What happened to the fall? I moved up north to avoid being in this situation dammit! Underclassmen in a 10am Philosophy of the Arts class. They are so full of themselves and just spew off some of the most annoying things. Nobody cares about how many times you can use the words "scholar" and "genius" in a single sentence, or that you aspire to be like Niche. Here's an actual quote: "...So while a genius can top a scholar, the totality of scholars building on scholars dwarfs the genius' intellectual blah blah blah". Sorry about that last part, I stopped listening after a certain point. The lack of money in my bank account. While I may have some cash in my pocket, that's only because I was paid in cash the other day, and my bank account is still starving. The fact that I haven't done any form of Yoga in over a month. Not to get all yogi sounding, but I can feel all the toxic grossness building up in my system, and it puts me in a grumpy mood. My stalking searching abilities are really good, in fact, so good, I probably shouldn't announce that to the interweb. But I follow the logic that if it's online, it's game for being found. I follow this in my own life too, and don't post anything (here or on fbook) that I wouldn't want to be found by someone. I've recently started a massive picture de-tagging spree, there are far too many unpleasant photos of me up there. I'm pretty observant and maybe I'm just super creative in what I choose to search for, but I can usually find what I'm looking for. However, I've found that some things you have no control of. For example, I googled myself today, and was somewhat intrigued by things that I found. There are some interesting articles about me from a major project/competition I was involved in. Random people "@ tweeted" at me that I never knew about, and a few random references (what in the world is technorati? someone fill me in!). I do know that several people out there know my nickname and have googled it to find me, I'm fine with that. I have opened a window to my life, knowing that there will be a few people looking in that I'd rather not be there, but I don't want to make this place completely private. I revel in finding new people through other people's blogs, and I love it when people connect to me through it. I have, on occasion, thought of starting up a completely separate, anonymous blog somewhere out there and then having the freedom the post whatever I want without being worried about who will or will not see it. The only reason I haven't yet is because I haven't thought of something that will make me totally unidentifiable in terms of blog name and user. I have several friends who ask me "what's the point of blogging? Why put it all out on the internet for everyone to read?" 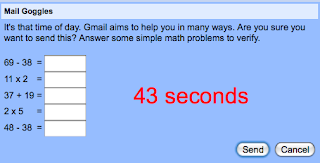 My answer? Because I want to. I see this place as being somewhere that is completely mine. I can express my opinions, and say whatever I want to say. It's also a great creative outlet, and I like to think that my writing has improved since I started. And finally, the "blogosphere" is such a great community. People connecting with strangers through a few strokes on a keyboard is something that continues to fascinate me (in a noncreepy way). I have made several friends through blogging, and although I've never actually met them face-to-face, they are still people that I've come to care about. That's not to say that I've abandoned all my real friends. I'm not about to dive into the creepy world of "Second-Life" or anything like that, even The Sims got to be too much for me. I'm not interested in living a different life than what I do in reality, which is why I think the blog works for me. I put pieces of who I really am out there. What are your thoughts? Do you have friends who don't quite get the whole "blogging" thing? What were your reasons for starting your blog? I'm stealing borrowing this from kelly over at masking and unveiling because i thought it was pretty interesting. 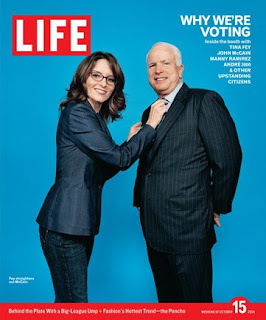 This is the cover of LIFE magazine from 2004, featuring John McCain and Tina Fey. Who knew in 2004 that this would be so funny now? So, yesterday, I was standing at the corner and the crosswalk still had a few seconds left on it, but I decided to wait because I saw my friend coming up my side of the sidewalk. A couple others go for it, because like I said, there was still time on the clock. Well, all of a sudden, this cop comes SPEEDING around the circle, trying to make it through his yellow light, and has to slam on his brakes for the remaining crossing pedestrian. This kid happens to be someone I've known since freshman year. The cop honked at the poor guy, and then SCREAMED at him. The guy was obviously totally confused as to what had just happened, and didn't really understand why someone was yelling at him. This upset the cop, who then decided that he wasn't in a hurry after all, and could take the time to pull my friend over to give him a ticket. Are you serious?? He still had time on the clock! The only reason he stopped was because you YELLED at him, you moron! Another fun cop story: A couple weeks ago, a friend was driving on the interstate, and saw that there were two cops pulling someone over on the side of the road. She calmly merged into the other lane, because of the law that states you can't be in the lane closest to the cop when he's pulling someone over. She's keeping up with all the traffic, and is not going excessively over the 75 mph speed limit. Next thing she knows, one of the cops got into his car, caught up to her, and pulled her over! Genuinely confused, she wanted to know how fast she was going, because according to her it was just about 75. The cop was extremely rude and stated that they clocked her as going 85. Um, how? You were out of your car, and there were so many people that passed by at that second, how could you POSSIBLY know it was her? I understand that not all cops are power tripping fools who get off on making people squirm, but I can't say I know any. Have I mentioned I'm not a huge fan of cops?